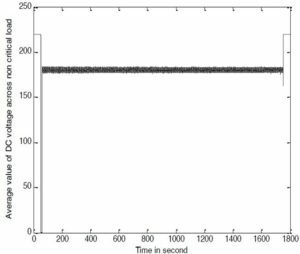 This paper deals with the reduction of power drawn from the supply system during generation un-certainties in D.C Micro grids using D.C Electric springs. In this work supply system is modeled using a fluctuating power source and a battery i.e. during generation uncertainties the system runs on battery support. A small micro grid system which has a critical load and non-critical load has been taken for the study and the simulations are done in MATLAB. The objective of the proposed work is to conserve power by making the non-critical loads draw less power during generation uncertainties which in turn relives the battery and renewable generator to the possible extent. D.C Electric springs are extension to A.C Electric springs used in A.C systems which make the non-critical loads draw less power by adjusting the voltage supplied to them. The D.C Electric spring presented in this work is different from the existing technologies present in the literature in terms of the circuitry used and its interpretation with mechanical spring. From the proposed work it can be established that usage of D.C Electric springs in the existing D.C micro grid systems can largely relieve the battery and the renewable generator during un-certainties in the power generation by the source. For the considered fluctuation pattern of the output voltage there is a saving of 8 % in the power drawn from the battery and also by looking at the saving in the power drawn from the supply system during generation uncertainties it can be seen that there is 12 % reduction in the power drawn which means that using D.C Electric Spring not only the battery storage requirement gets lesser but also the power drawn from the supply system as well as the source gets reduced which means that usage of D.C Electric spring in the micro grid system will realize both the objectives. It can be noted that for a different pattern of output voltage of the source the reduction in power drawn will be different. 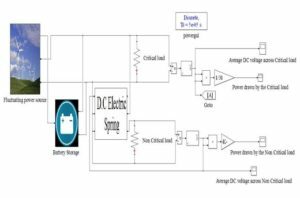 The future scope of this work can be on developing suitable devices or equipment which can operate at higher voltage tolerance and such devices will be useful if the micro grid structure is weakly regulated. Further this type of technologies can be used in D.C micro grids to reduce the energy storage requirements in future. Kakigano H, Miura Y, Ise T. Low-voltage bipolar-type DC microgrid for super high quality distribution. IEEE Transactions on Power Electronics. 2010;25(12):3066-75. Engelen K, Shun EL, Vermeyen P, Pardon I, D’hulst R, Driesen J, Belmans R. The feasibility of small-scale residential DC distribution systems. InIECON 2006-32nd Annual Conference on IEEE Industrial Electronics 2006 Nov 6 (pp. 2618-2623). Rani BI, Ilango GS, Nagamani C. Control strategy for power flow management in a PV system supplying DC loads. IEEE Transactions on Industrial Electronics. 2013;60(8):3185-94. “Germany’s green energy destabilizing electric grids,” Institute for Energy Research, Jan.
 Moslehi K, Kumar R. A Reliability Perspective of the Smart Grid. IEEE Transactions on Smart Grid. 2010;1(1):57-64. This entry was posted in Blog, website and tagged A.C Electric springs, Analysis of DC Electric springs in the micro grid system consisting of fluctuating Energy sources, D.C Electric springs, D.C Micro grids, fluctuating power source, mechanical spring, non-critical loads, renewable generator. Bookmark the permalink.